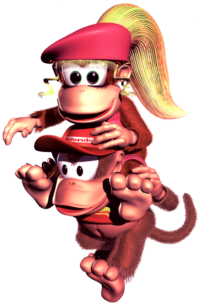 Teaming-up is an ability used by Diddy Kong, Dixie Kong and Kiddy Kong in the games Donkey Kong Country 2: Diddy's Kong Quest and Donkey Kong Country 3: Dixie Kong's Double Trouble!. Teaming up is when one Kong goes on another Kong's shoulders. This slows down the speed of the player when walking, but gives the Kongs the ability to throw each other to defeat enemies, or find higher ground. If the player presses the Button, they can make a monkey pick up the other and then throw him or her by pressing the button. Pressing again will split up the team. In the Game Boy Advance remakes, the Button does the Team-up move, unlike the original SNES version. This move is never performed at all in Donkey Kong Land 2 and Donkey Kong Land III, due to the Game Boy having only the (jump) and (attack) buttons. The Kongs use the Team-up move in Donkey Kong Country 2. 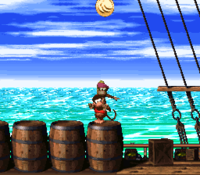 In Donkey Kong Country 2: Diddy Kong's Quest, Diddy Kong and Dixie Kong are able to use the Team-up move. This can get Diddy and Dixie to higher areas and even reach some Bonus Levels. In the Game Boy Advance, Team-up enables the Kongs to defeat Krunchas. In the game, Donkey Kong Country 3: Dixie Kong's Double Trouble!, teaming up differs depending on which Kong is on top. If Kiddy Kong throws Dixie, they can destroy enemies and go to higher floors. If Dixie throws Kiddy upward, they can break some parts of the floor to reveal secrets upon landing back on the ground. Dixie can also throw Kiddy to the left or right to defeat some enemies, although not Buzzes. If the young Kong is thrown against the wall, Kiddy will bounce back and ride the other way. Dixie can now jump on him and ride, as if on a barrel. In this state, Kiddy has the momentum of a Steel Keg. This page was last edited on December 5, 2018, at 11:23.